Uranium glass is made by adding small amounts of uranium oxide added to the glass mixture, usually the purpose is to give a strong green or yellow colour. Vaseline glass is glassware that is made with uranium content to give a pale yellow green colour similar to that of petroleum jelly. Uranium glass can be detected with a geiger counter, or an ultraviolet (UV) light. Uranium glass glows bright green under UV light, and this fact has led to uranium glass becoming popular with collectors. Sowerby art deco uranium green glass posy bowl, pattern number 2570. Ref: click here Sowerby art deco frosted green glass 'Ladye' powder bowl. Murano uranium green + red glass bull. Murano uranium green + red glass donkey, labelled. Art deco uranium green glass 'Carnival' butter dish, by Bagley. Art deco uranium green glass 'Greta' vase, by Walther & Sohne. Art deco uranium green glass 'Bamboo' vase, by Bagley. Art deco uranium green glass 'Wyndham' vase, by Bagley. Art deco uranium green glass razor hone, by Lilicraps. Uranium yellow glass cake stand. Who Wants Radioactive Glass ? – I Do. Barrie Skelcher ~ Author of "The Big Book of Vaseline Glass"
Mention the word radioactivity and most folk will cringe, think of cancer and the atomic bomb. The fact is that radioactivity has been with us since the world began and that life has evolved in a radioactive environment. One of the most used radioactive elements is potassium, it will be found in some garden fertilizers and even in the substitute “low sodium salt” which now appears on some shop shelves. It is potassium that makes the Dead Sea, arguably, the most radioactive sea in the world. Another element that is widely distributed throughout the Earth’s crust is uranium, and that, as every schoolboy and schoolgirl knows, is radioactive. For over a hundred years it was used extensively in the glass industry. Uranium was discovered by the German chemist Martin Heinrich Klaproth, who reported his findings in 1789. In fact he had not isolated the element but its oxide. It was not until 1841 when the French Chemist Eugene Peligot isolated the metal itself. That did not stop the element being used to colour glass, just when this first took place is uncertain. There is a contention that it may have been used in Roman times, this hinges on a piece of mosaic found while excavating a Roman Villa near Naples. This is tenuous and is unsupported by other evidence. Discounting this, various other pieces of evidence suggests that it was sometime between 1800 and 1830. In those days it must have been an expensive commodity, a surviving Stourbridge batch book, dated 1860 –77, indicates that for a batch of “opaque yellow” which contained about 0.7% uranium, the uranium would account for about 60% of the total material cost. It is likely that the discovery of uranium deposits in the USA in the 1880’s brought cheaper supplies to the market and lead to the expansion in the use of this element. It probably reached the peak of its popularity in the first part of the 20 th century. After WW2, despite the abundant availability of “depleted” uranium, its use in the glass industry rapidly declined and is now only used by a few glasshouses in specialist production. This may be due to there being other means of producing similar colours and at the same time ever greater health and safety restrictions on its use. Not withstanding there are still many examples of uranium coloured glass in use and waiting to be discovered by a collector. So why did uranium glass become so popular a hundred or so years ago? There are probably two reasons. The first concerns the range of colour that it could produce in glass, and which could not be obtained by other means. These range from turquoise to green to yellow to topaz to amber within which there is almost a continuum gradually changing shades. Perhaps the most popular of these amongst collectors is what has become known as “vaseline” glass. It is greenish yellow with a slightly oily appearance and closely resembles the well known petroleum product. Unfortunately some modern dealers now stretch this to quite unjustifiable lengths. I have even seen items described as being “pink” or “blue” vaseline glass. The second reason for its popularity in those distant times is probably related to the characteristic, ghostly green, fluorescence that it shows under ultra-violet, (black) light. I am not suggesting that the Victorians and Edwardians flooded their rooms with this invisible light but rather that nature did it for them. Although gas lighting was starting to make an impact a lot of properties still relied upon oil and candles. These would not be lit until the last moment when the twilight finally gave way to darkness. As the sun sets the first colour in the spectrum to go is red, the last is violet and with it the neighbouring ultra-violet. Thus as darkness falls the ultra-violet component of the spectrum predominates and uranium bearing glass starts to glow. It must have been an attractive sight in those homes of long ago. There are two easy ways to detect the presence of uranium, neither are absolutely fool proof. The most popular is with ultra-violet light. It is now possible to buy, for a few pounds, u-v light sources that are designed to detect forged banknotes, some can be as small as the fob on a key ring. The drawback with u-v light is that it can not be used in strong sunlight. Also some other agents fluoresce much the same as uranium. In recent times I have seen glass items coated with such agents and to the inexperienced or unwary they could be mistaken for uranium. Some glasses, especially those which are heavily leaded and of dark amber colour only respond weakly and could be overlooked. The alternative is to use a Geiger Counter. These are much more expensive and may well cost over £100. If a Geiger is used it should have a thin window and be suitable for measuring beta radiation. A good test for the suitability of such an instrument is to hold the detector against a bag of sulphate of potash, (fertilizer) and see if a reading is registered. If it is, then the instrument is sufficiently sensitive. Even the Geiger is not foolproof. Some glasses with high potassium will give low readings. More importantly some, which have been made with sand naturally contaminated with thorium. This could occur when ceria has been used , instead of uranium, to produce a yellow. If the cerium had been obtained from monazite sands then it would like to have thorium as an impurity. Thorium does not fluoresce under u-v so a combination of the two tests is very reliable. The advantage of the Geiger Counter is that it can give a good approximate measurement of the uranium content of the metal. Finally if you ask is this glass dangerous, the answer is may be, may be not. 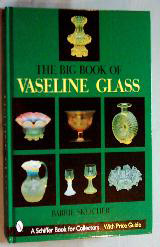 Read “the Big Book of Vaseline Glass”, by Barrie Skelcher, pub. Schiffer 2002, to find out more.